The Universe is dominated by a preponderance of complex systems, many of them could fit the definition of chaotic systems which are roughly defined as systems with complex physical processes that demonstrate sensitive dependence to initial conditions. Put another way small perturbations in the forming conditions of a complex system that controls its development can lead to radically unpredictable outcomes. It is a concept beautifully illustrated in one of its foundational principles the Butterfly effect. Technically this is defined as: the “sensitive dependence on initial conditions in which a minor fluctuation in one state of a deterministic non-linear system can result in profound differences in a later state. More poetically stated that “A butterfly flapping its wings in Brazil can set off a tornado in Texas.” In essence what this means is that small changes can have big results and we will never really know how and why. This is also the logic behind Black Swan events, those out of left field events that occur with far reaching and global consequences that we cannot predict and rarely ever see coming. 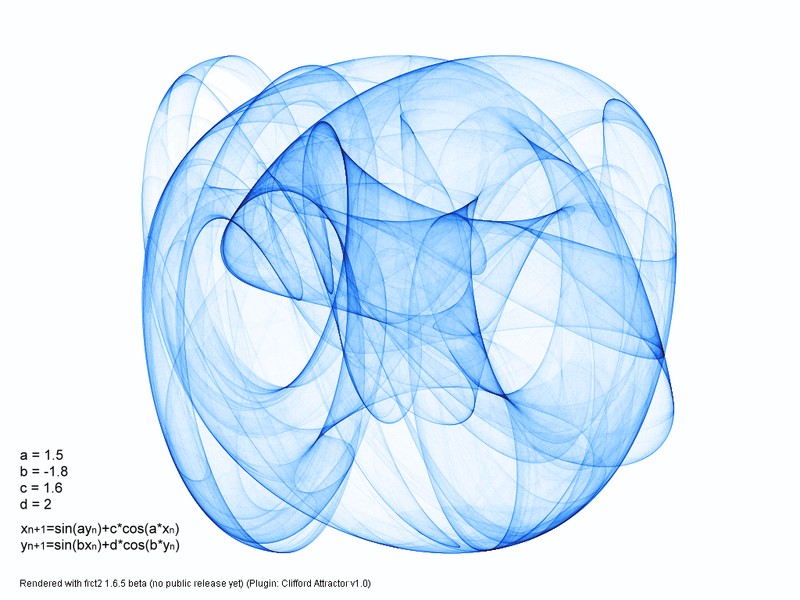 A Strange Attractor is a mathematical representation of these mechanisms and tendencies, and helps us to essentially predict the unpredictable and reveal underlying order. It is an apt metaphor for the times we are living through in which uncertainty rules the day and probability is a better guide than determinism could ever be. It is also a description of what we are collectively doing to ourselves now. Climate Change is the biggest symbol of this entire concept, here we are a species on the planet that is introducing a small change (CO2 concentrations in the atmosphere and oceans), to the initial conditions to the planetary climate system (which is a chaotic system), and the results are wild and unpredictable and quite possibly not very favorable for us. Society is also a dynamical and complex system that follows simple rules and demonstrates sensitivity to initial conditions, as such it follows the logic behind the butterfly effect, as evidence of this market crashes are driven by these perturbations in market conditions and can have unpredictable results as they shift the downstream behavior of individuals and collective structures. More broadly our economy is what is driving the change in climate and it acts based on this principle. Knowing that we are the initial condition causing perturbations and that it through our socially constructed economic mechanisms that we are doing it, I propose the first challenge of our global initiation. We need to come up with a social meme, a shift in our own society’s initial conditions that will have far reaching implications. Could it be that shifting individual behavior and perceptions of our place in the natural world that ultimately will lead to a disruption of the current trajectory we are on and a much needed radical departure into a course correction that allows us to avert an emissions scenario in which we cause catastrophic climate change with unpredictable and ultimately disruptive implications for our species? It remains to be seen, but perhaps we have a natural principle as a force we can use to effect this kind of change and be ourselves a strange attractor that causes the shift in initial conditions. I bring this all up because it is the theme for the month’s astrological transitions. These are two very dynamic energies that have been fused into a complex (the conjunction) Venus is symbolic of feminine energies and Mars is a symbol of masculine dynamics. The two here are fused into a great harmonic and in a feminine watery sign that is concerned with legacies, intuition, the subconscious and more important cultural inheritance. This is a placement that bodes well for those who are looking deeply into culture and trying to understand its longer term implications, it lends itself particularly well to blending the best of two worlds into a synthesis that can then be transferred to other generations, and given the state of the world this is very vital work to be done. If only a small segment of the population, about 2% did this deep work, it would be enough to achieve critical mass and change the entire direction of our cultural trajectory. What immediately comes to mind is Naomi Klein, here is a woman, a journalist who has managed to adeptly balance her work between logic and passion and all in a unique, and radical presentation that speaks to her authenticity and vision for a world beyond the consensus reality that is fast unraveling the global integrity. It’s an apt image for what this configuration invites, it says that authenticity and marching to the beat of our own drummer is a must and it does so with enthusiasm. On a collective level it is the active investigation into solutions for intractable human problems using insight, intuition, calculation, study and technical prowess, especially technologies that harness the forces of nature towards regenerative aims that seek to liberate humanity. I am certain that one strange attractor that will be welcomed back to direct station is the eponymous and sensual Venus. She has been shimmying her way through Dark Goddess territory retrograding through Cancer and now she stations direct giving us all a chance to now reverse course and move forward on matters of the heart. She will leave Cancer starting today and make her final pass through the sign of cultural legacies on the 23rd, and then enter the fierce territory of the Lion on the 24th, it is here she becomes the Red Queen. This iconic character from Lewis Carrol’s “Through the Looking Glass” may have played the antagonist but she is better known as the red hot love Goddess, more like the lusty star Aldeberan and less the off with her head mentality. It also became a euphemism in Jeremy Ridley’s Genome follow-up book about sexual selection and this seems a more apt metaphor for the Venus in the sign of the Lion. It is here that we begin to understand the deeper currents of how sexuality shapes our species ultimately through the ever accelerating interchange that is attraction. It can sometimes feel like running in place, that one has to keep running just to keep pace with the dizzying juggernaut, but yeah, evolution is kind of like that and it is never over. In any case passions run high and things get real, an interesting note, often when planets transit through this sign social relations can be strained and social tensions come to a head. I expect we will continue to see tensions develop around the Syrian refugee crisis as many more flashpoints are experienced in this long process, it is my hope that the fierce courage and profound affection of the Lion will translate into widespread humanitarian concern and action to the plight of these refugees our fellow Earth siblings. This one has a rich tapestry of meaning and of course anytime you are dealing with Pluto that is the case. In this one it is the impulse to dig deep and seek the heart of matters. There is an obsessive attention to the details and minutiae of evidence in this quest and it has much to do with speaking out against the excesses of the elite and those at the top of global power hierarchies. The danger is falling prey to conspiracy theories and being so suspicious that it works against the cause at hand. Conspiracy theories are seductive in their suggestion of hidden causes behind the world order the only problem is they are based on little to no evidence and they appeal to a well-known human perceptual bias that of ascribing agency to phenomena where there is none. Dig but also keep the clear light of reason on the horizon Collectively this is a warning to not become paranoid given the vast opportunity to do so our culture can be so surreal at times it is hard to believe, but reality is just strange especially when you look deeply into it and see it in all of its fractal details. Leo is a fire sign and fire signs are all about creation, creativity and expression. We know that everything comes from the core of long burned out stars, and Leo in particular carries this memory in its elemental DNA. This is a lunation in which the qualities of generosity, pleasure, and creativity are highlighted. Collectively is can signal the possibility for those in power elites to be exposed to the masses and critiqued for their transgressions. It’s a time when corruption can have the lid blown off of it through methods that are under the radar. Along with the month’s theme, it could be something seemingly insignificant that has profound consequences. Coinciding with the Full Moon is a partial solar eclipse. Eclipses can be powerful times they are excellent opportunities for clearing and integrating shadow aspects and dealing with unprocessed material arising from the individual and collective unconscious. Most importantly it is a time we can individually look at the human dark side and integrate and clear aspects related to ancient collective wounds and bifurcations, and that is very much all related to small changes in initial conditions. The Earth is a dynamic system made up of self-repeating patterns and precisely tuned cycles that create feedback loops and regulate one another. This is a perfect metaphor for Virgo and how it operates. Virgo is the cipher that is capable of coordinating and sorting out the many details from the sub atomic to the cosmic and creating systems that coordinate and organize the seemingly disparate elements into a coherent and seamless system a kind of operating system. As much as we take these processes and sadly these people who carry the Virgo DNA for granted they are essential to our survival whether it is the life support systems of spaceship Earth or the systems that monitor our daily lives and make them flow seamlessly. Virgo holds this legacy and why not, it has the most days of solar transit of any of the zodiacal signs. There is a subtle revolutionary energy at play here along with a more deceptive Pollyanna tendency, the world can appear subjectively brighter than it actually is and when reality creeps back in it can generate a feeling of disillusionment which is the best possible thing that can happen because it disabuses of us of our illusions. Collectively it can signal a time when the illusion that a consumer society and an unquestioned elitism can cast over the masses. Those of us so inclined will question the deceptions that are used in service in maintaining the status-quo, and will open to the possibility of seeing the writing on the wall and exposing propaganda used in the service of keeping us all asleep and consuming endlessly. It starts as a small imperceptible inkling that something is out of synch, and then as more of reality finds its way in it becomes an inspirational awakening, one which unveils the interconnected nature of the world we reside in, an inspired truth can sink itself into the subconscious mind, that we are truly inextricably linked to one another and no elite or special interest group can change that essential connection, living out the implication of this understanding is revolutionary in an atomized world. The wrenching process of examining tribal legacy meets the far reaching intuitive vision of the technological imagination. This is a unique configuration it doesn’t happen often throughout a sidereal year and opens a unique praxis it is one in which individuals are awakened to deeply examine the culture they have inherited from centuries of social evolution. We begin to question the underlying assumptions and welcome flashes of insight that help to reframe the social mind, we are emboldened by ancient legacies of being a social species and enticed by new advances in social organization and technological development designed with the aim of improving all lives all around the world and mitigating crises that through our actions are unavoidable. What seems insurmountable becomes navigable by trusting our most unusual perceptions. How appropriate that it falls on the day of the September Equinox a time of balancing of light and dark and the inauguration of the dark half of the year for the denizens of the Northern Hemisphere (the light half for those in the Southern Hemisphere), on the Witch calendar the day is called Mabon/Eostre-Ostara. Reflecting themes of the earlier square paranoia the uniquely unparalleled failure of logic rears its head once again although amplified into a hydra, one head is cut off and a thousand new threads grow in its Internet place-holder, it is a reminder to maintain critical thinking and not fall for theories based more in speculation than evidence and common sense. There is an interesting paradox about 21st Century life for those that are attempting to move society forward towards a fair and more secular society there are a number of collectives protecting their various interests and attempting to move society back into a more theocratic and authoritarian construct, one in which the Rule of Law is replaced by the Authority of “Imaginary” intelligence (to paraphrase Dan Savage) The conflict is highlighted under this transit. We will see that those ideologically motivated by ancient legacy will insist that there “religious liberties” are being impinged upon, when in fact it is there duty to follow civil law which abridges none of their freedom to exercise their religion in a non-public context. Personally, we may find ourselves wrestling with our own atavistic tendencies and the thornier issues of dealing with cultural legacies that keep us trapped in primeval prejudice and constrain our imagination. Apocalypse is an ancient Greek term that meant “uncovering” and referred to a literal disclosure of knowledge. In our culture it has come to mean an event of catastrophic destruction so disruptive that it renders its victims powerless to rebuild or reconstruct in the aftermath. I prefer to utilize its original meaning and state that this moon will be a rather powerful one lending itself to leaps of intuition that reveal cosmological and timeless truths, whether they be about existence itself or something more mundane, they will all be profound in their implications, and like Chaos Theory reveals reality can be quite strange, mysterious, unknowable, and strange, perhaps reality is its own strange attractor, that convinces us of its total randomness and then blindsides us by its very surreal unfolding. This aspect is said by many Astrologers to be one in which Mercury is combust, as Mercury is never more than ten degrees of separation between the two (Mercury shares an intimate orbit with the sun). In combust states Mercury is no more than 3 degrees from the Sun, it said to make it harder for Mercury to activate his vibration because he is consumed by the Sun I am more prone to suggest that he is consumed in the Suns passion and becomes much easier to express, as he is radiating in the same glow as the stellar dynamo. In this case the devil is in the details it is wise to bring focus to the way life is operating and make any improvements in the efficacy of these self-regulating systems this applies individually and collectively. How is the system operating? Could it better serve us? Could it be improved? Cogent questions. Astrology isn’t a religion. We’re not sure it’s a science, either. It’s magic, maybe. But, as with feng shui, say, things affect things. So as long as we don’t go blaming our problems on the stars, as long as we assume responsibility for our own actions…well, hell, a little auspicious coincidence and applicable wisdom can’t hurt. And so, with that grain of salt…enjoy! Smith, T.M., Karl T.R., Reynolds, R.W.”How accurate are climate simulations?” Science, (2002, April 19). Vol 296/5567 pp. 483-484, DOI: 10.112/science, 1070365.